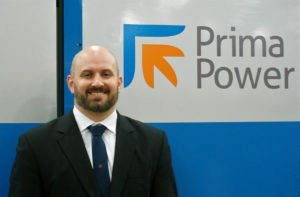 Prior to joining Prima Power Laserdyne, Mr. Rickard was the West Coast Regional Sales Manager for Bystronic Inc., a provider of 2D laser systems to both contract and original equipment manufacturers. Mr. Rickard started his career in the welding industry with ESAB Welding and Cutting as a Territory Sales Manager and became proficient in the service and sales of welding systems and welding processes. Mr. Rickard holds a Bachelor of Science degree in Industrial Technology from California Polytechnic State University, San Luis Obispo. He resides in Las Vegas, Nevada with his wife Ashley and son Dash.